Look, anyone that thinks John McCain understands the troubles of the middle class needs a reality check. If the following video doesn't do the trick, check back soon as there's bound to be more where this came from. Oh, just to set this up properly, keep in mind that John McCain wants you to believe Barack Obama is an elitist. There are times when I'm sure the United States won't survive the remaining days until we elect our next president...let alone the day after. As I watch the McCain campaign succumb to increasingly divisive acts of desperation...fomenting fear and animosity by directing innuendo at ignorance...I can't help but question the recklessness of his ambition. If the role of leadership is to advance our society, then political appeals predicated upon a least common denominator equation are an affront to that objective. Frankly, it's difficult to blame those voters who are vulnerable to gutter politics as a result of generational prejudices, isolation from mitigating influences, and limited educational opportunities. Notwithstanding, there is great danger in inciting those who lack the tools to make objective conclusions. Those who willfully engage in this kind of misdirection are little more than manipulative opportunists who must be exposed and rejected. Dividing this nation to advance one's ego is an admission that the advancement of the ego supersedes the enlightenment of the electorate. To understand the risks of tactical cynicism, take a look at the following two videos. The first is the latest McCain campaign ad. The second is from a recent rally supporting the McCain-Palin ticket. I think this third video amplifies my argument and points to another underlying issue. With a number of these voters, the McCain strategy is designed to allow them to unleash racist hatred under the guise of a new label. One can easily see how a term like "terrorist" is now being substituted for "n*****"...a term they realize would draw even more outrage and accusations of blatant bigotry. This cynical ploy is despicable! While watching the second video, it's easy to feel outrage at the individuals espousing uninformed opinions. However, if one takes the time to consider the construction of their conclusions (see the first video), it's clear that they are being intentionally misled. The fact that they can creates an opening for those who would put the pursuit of power and profit first. The more fear the McCain campaign can invoke, the less likely rationality and reasonability can be restored. This is the dilemma we face. Sadly, the fact that fear can still succeed in trumping the economic self-interest of these individuals is disheartening. In the end, those who frame this election as a battle between good and evil appear to be the ones planting the unsubstantiated seeds of the evil they callously erect in order to oppose. The only plausible cure for this brand of politics is to deliver a crushing electoral defeat to those who have chosen this course of action. Only then will there be a deterrent to the politics of distortion and deception. Should this happen, perhaps future elections can focus on real issues of import to average Americans. For voters to be receptive to reconsideration, the cynicism of their leaders must be exposed and exterminated. Frankly, if our increasingly dubious economic situation isn't sufficient to force us to see through these absurd distractions, it may require even more suffering for us to discern rhetoric from reality. It seems to me that some of the people we see in the above video have become so removed from rationality that unless and until Barack Obama personally hands them a loaf of bread and a bowl of soup, they'll hold fast to the fabrications they've been fed by the McCain campaign. Unfortunately history tells us that extremist ideation is often most influential when economic turmoil prevails. It is even more ominous when some leaders choose to intentionally exacerbate it by linking the societies financial difficulties to cultural and moral considerations. In times of tumult, there is always the risk that some people in positions of power will see scapegoating as the path to power. Two years ago, when I suggested the housing bubble fiasco would exponentially eclipse the S&L scandal, there were many who called me a partisan alarmist. Two months ago, despite repeated assurances to the contrary from those in power, the dominos began to fall in rapid succession...exactly as I'd predicted. While the toll is just beginning to be tallied, the damage has been done and it will be huge. Today, I'm going to offer another prediction...not because I want it to materialize...but because history instructs us to do so lest we find ourselves repeating the same mistakes over and over again. This nation is on a trajectory for tragedy. In our unwillingness to face facts and find common ground, we are laying the groundwork for vilification, violence, and victimization. When evil opportunists identify the emergence of this dynamic, they are drawn to exploit it for power and profit. Unless the forces for good intervene quickly to derail this downward spiral, we'll eventually find ourselves quantifying the coming calamity in corpses. Soon after, we'll utter the words that history tells us so often follow these days of darkness, "Never again, never again." I hope history will conclude that my voice was one of many who sought to sound the alarm in advance. If doing so now makes me a pessimist, I'll glady accept the attachment of that label if my warning can contribute to transforming a looming tragedy into an historic high point at which the human spirit was able to choose good and extinguish an emerging evil...without the needless shedding of blood. Only then will we have fulfilled our prior promise of, "Never again, never again." On that rather gloomy note, I'll turn to sarcasm and snark as it is often the only means to escape the unease such speculations unleash. It also offers an alternate means to expose essence. The following list is offered to illuminate the absurdity of the rhetoric being employed at recent Republican rallies. Are you in the habit of purchasing Café Lattes from Starbucks? In a McCain administration, it will be assumed you supported the socialist ideology of the French revolution. Check you're children's toys; the McCain campaign is suggesting parents who purchase Chinese toys are indoctrinating them into communism. Are you attending independent foreign films? If so, it won't be advisable under a McCain presidency unless they're Canadian (but not French Canadian...only the provinces that share an "international" border with Alaska are acceptable). Better check that passport...if you've been to Venezuela, you're a Hugo Chavez sympathizer and subject to airport detention under the Super Duper Patriot Act proposed by John McCain. Are you a gay man living in the Castro in San Francisco? If so, a McCain administration will view you as a subversive militant homosexual with strong ties to Cuba. How about a ticket to Guantanamo? Think of yourself as Joe Six Pack? Better not be drinking German beers like Becks unless you want to be placed on the McCain-Palin list of Neo-Nazi Holocaust deniers. Are you receiving your education from a prestigious east coast university? Might want to reconsider attending North Idaho College, Matanuska-Sustina College, or the University of Idaho. Sarah Palin's vice presidential platform includes rooting out those doggone un-American elites. It's all about proper pronunciation...unless you drop the "G" from the end of at least one word in a sentence, the McCain campaign might think you're a freakin' for'ner. Watch those middle names for male children. It's far better to choose a girl's name (Sydney's nice, eh?) than one associated with a deposed dictator. However, if you do choose a girl's name, that male child must never be allowed to visit San Francisco (see number six). Palin etiquette, Palin etiquette! They're pumps; not stilettos. Everyone knows a truly liberated American woman attaches a stiletto to a rifle...while wearing six-inch pumps. The moustache is optional. Recent Republican campaign events seem to suggest that the GOP has decided to relegate the heavy lifting to the likes of Cindy McCain and Sarah Palin. It's as if Gramps has lost his mojo or lacks the stomach to spout the slights that so easily exit the lipsticked lips of his high heeled sidekick, Sarah. Take a look at Cindy calling out Barack Obama earlier today. Perhaps Old McJohnny needs to check his Calvin Kleins to see if he still has his cantankerous cojones. I'm sure if he asked Sarah, she'd be happy to have the First Dude give him some lessons in snow machine machismo. After all, a frolic in the frigid wilderness might boost McDoo-da's boudoir bona fides with Cindy "cold chill through her body" McCain. Speaking of the beer-bottlin-beauty, if Barack Obama takes her up on her challenge to "change shoes with her", Daddy-dang-dang-wants-the-dough might have to pony up to buy his haughty heiress a new pair of shoes...and we know Cindy "cash register" McCain is into highfalutin haute couture. Back to Barracuda Barbie, it seems like she's finally decided to let her hair down...literally and figuratively. Betcha by golly wow, she's gonna do some more doggone interviews with Faux News...and there's rumblings she might make a cameo appearance on SNL. 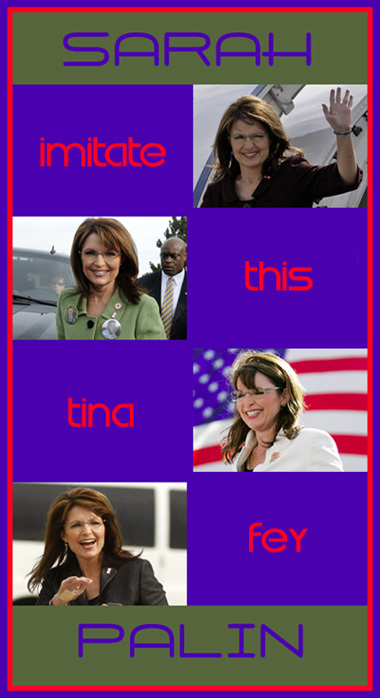 Given the fact that she's abandoned her Betty-the-beautician coiffure in favor of becoming a Breck-Girl-Gone-Wild persona non grata politician, it may be tough for Tina Fey to continue to imitate our impish Alaskan icon. Then again, how hard can it be to pretend to be someone pretending to be someone they're not, eh? When John McCain backed out of his appearance on The Late Show to rush back to Washington DC to save the country, David Letterman wasn't too happy...especially since he spotted McCain making an appearance in NYC with Katie Couric at the very time he was supposed to be seated next to Dave. The night it happened, Letterman made a statement to the effect that the election runs through him. Given his relentless jokes at the expense of John McCain and the following video spoofing Sarah Palin, it appears that Letterman is determined to make it so. In the following video, The Onion has a little fun with John McCain's marriage to a wealthy beer heiress...suggesting that the McCain economic plan involves encouraging taxpayers to find and marry an heiress of their own. McCain argued that doing so is a sure way to achieve economic security. Unfortunately, the McCain team stopped short of assuring taxpayers that marrying an heiress would guarantee the ownership of seven homes, thirteen automobiles, and a personal jet. Though unspoken, there seems to be an inference from the McCain camp that those added benefits would only be available to former POW's. There was no word on whether additional perks would be made available to those who dump their current spouse in favor of an heiress. John McCain promises to bring change to Washington. Unfortunately, the change he offers is little more than a change in his positions in the hopes of achieving political advantage. Beyond that, I suspect John McCain's idea of change is also subject to his petulant temperament. In the following video, we get to see a candidate who is seemingly confused by his own willingness to flip flop positions at the drop of a hat. Truth be told, John McCain isn't old; his attempt to hoodwink the public with slogans lifted from his opponent is old...and tired. 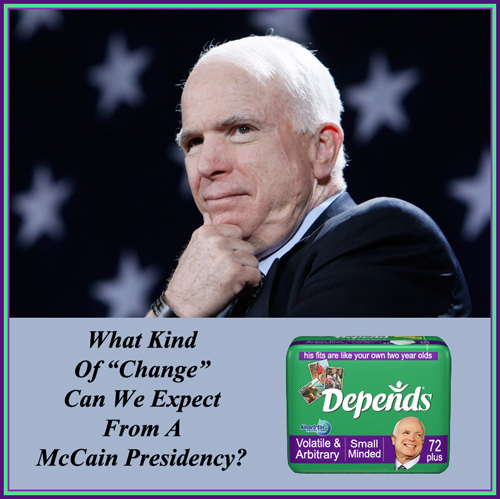 Following the video, I've included a tongue-in-cheek graphic that summarizes the kind of "change" voters could expect from a McCain presidency.